Jordan Witzigreuter, better known as The Ready Set, is finally releasing a new album for the first time in three years. The Ready Set’s debut album, I'm Alive, I'm Dreaming, came out in 2010 with insanely catchy hits like “Love Like Woe,” that got a decent amount of airplay. His new release, The Bad & The Better isn’t a game changer, but isn’t quite a dud either. Two years ago, Witzigreuter premiered “Give Me Your Hand (Best Song Ever)” while on tour with Boys Like Girls, giving us a taste of what was to come on his next album. It’s a party song with playful lyrics that could get anyone amped up, keeping up with his fun and happy past releases. It’s obvious that “Give Me Your Hand” was written long before the other tracks on The Bad & The Better with only one listen. The rest of the album has a much more serious vibe, which isn’t necessarily a bad thing. Although The Ready Set has released slightly more serious songs in the past, this album feels a lot more mature than the rest. Songs like “Are We Happy Now?” and “Bleeding” seem to have more grown-up melodies and beats compared to the rest. “Bleeding” could very easily be performed by a girl group like Danity Kane and have the same effect, which could be an interesting song to see performed live and could potentially be a good collaboration in the future. Overall, the album is very scattered, it feels like Witzigreuter was in different places in his life for every single song giving it that incoherent feeling. There are serious tracks, fun summer anthem tracks like “Freakin Me Out” and “Castaway” with a great verse from Jake Miller, but there are also some songs that totally missed the mark. “Fangz” is an overproduced song that feels like it’s trying to be a club hit, but isn’t quite getting there. Although the album is scattered, it has its hidden gems. “Luxury” shows off Witzigreuter’s vocal talents over a catchy beat. “Bitter and The Sweetness” is a cute summer track that puts a new twist on the style of his older material, adding a bit of a refreshing element to the album. The best song, “Carry Me Home” is an insanely catchy tune with simple lyrics and a melody that showcases everything Witzigreuter is good at. It’s definitely a song to blast with the windows down cruising around town this summer. 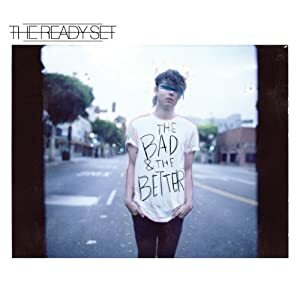 The Bad & The Better is a good third release for The Ready Set. He’s destined to make fans happy performing these songs live on Warped Tour this summer with his infectious energy and talent. Although there were some misses and not a lot of coherence, the album is pretty solid for a fun summer by the pool. The Bad & The Better will be released on May 27th via Razor & Tie.